NEW YORK (AP) — A huge construction crane being lowered to safety in a snow squall plummeted onto a Lower Manhattan street Friday, killing a Wall Street worker in a parked car and leaving three people hurt by debris that scattered as the rig's lengthy boom fell, officials said. The mobile crane's boom landed across an intersection, smashed several car roofs and stretched much of a block after the accident around 8:25 a.m. at a historic building about 10 blocks north of the World Trade Center. Robert Harold heard a crashing sound as the rig fell right outside his office window at the Legal Aid Society. "You could feel the vibration in the building," said Harold, who recounted seeing onlookers trying to rescue someone trapped in a parked car and seeing a person lying motionless on the street. The collapse killed David Wichs, a mathematical whiz who worked at a computerized trading firm, his family said. Born in Prague, he had immigrated to the United States as a teenager and graduated from Harvard University, said his sister-in-law, Lisa Guttman. "He really created a life for himself. He literally took every opportunity he could find," she said through tears. 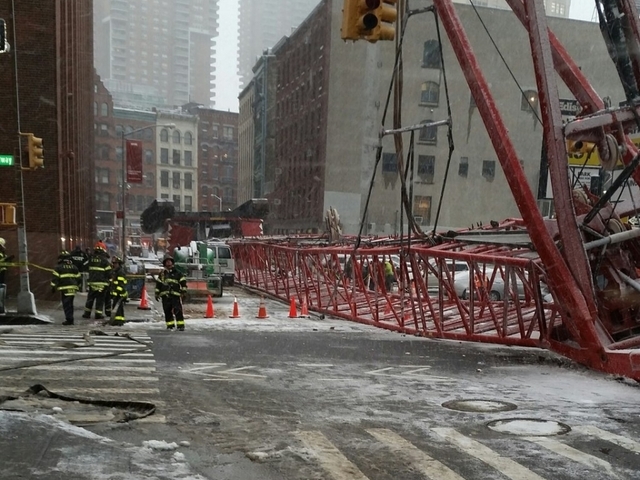 After the collapse, the crane's big cab lay upside-down in the snow with its tank-like tracks pointed at the sky. Red metal from the boom jutted up in an intersection next to a green street sign for the Brooklyn Bridge. Mayor Bill de Blasio said two people were seriously injured, while a third suffered more minor injuries. A bystander video shown to WABC-TV showed the arm, extended down the block, slowly crash to the ground. The accident happened as workers were trying to secure the crane against winds around 20 mph by lowering the boom, which had been extended to as long as 565 feet the day before, officials said. Because the crane was being lowered, workers were directing pedestrians away from it on a street that otherwise would likely have been teeming with people. "Thank God we didn't have more injuries and lose more people," de Blasio said. "It's something of a miracle that there was not more of an impact." Officials were working to determine why the crane fell. An employee who answered the phone at the offices of crane owner Bay Crane would say only that an investigation was underway and wouldn't give his name. The company officials identified as the crane operator, Galasso Trucking Inc., didn't immediately respond to messages about the collapse. Capable of lifting 330 tons, the rig had been working for about a week to replace air conditioning equipment and generators on the roof of 60 Hudson Street, a 425-foot-tall, Jazz Age skyscraper that once housed Western Union and takes up an entire block, officials said. City building inspectors had been at the site only Thursday because the boom was being extended so it could reach farther onto the roof, de Blasio said. Buildings Commissioner Rick Chandler said inspectors found no problems then with the crane, "but obviously, it requires investigation in terms of the way this was done," he said. The building's owners declined to comment. Nearby buildings were evacuated after the collapse and subway trains bypassed the area while fire and utility officials checked and rechecked nearby buildings for gas leaks. All 376 mobile cranes registered with the city, as well as all 43 of the larger tower cranes, were ordered put in secure positions. But another crane fell and killed a worker in April 2012 at a subway construction site that was exempt from most city building safety rules. In January 2013, a crane collapsed at a Queens construction site and injured seven workers. Last May, a mobile crane dropped a 13-ton air conditioner being placed atop a midtown Manhattan building, injuring 10 people. Cranes have also dropped loads or come close to falling apart in other incidents, including a dramatic episode in which a crane's boom nearly snapped off during Superstorm Sandy and dangled precariously over a midtown block near Carnegie Hall. This story has been corrected to show that the collapse happened Friday, not Thursday.